Why should we care about the Septuagint? Even though the Bible is one of the most widely read books in history, most readers of religious literature have no knowledge of the Septuagint—the Bible that was used almost universally by early Christians—or how it differs from the Bible used as the basis for most modern translations. Timothy Michael Law, author of When God Spoke Greek: The Septuagint and the Making of the Christian Bible, explains what the Septuagint is, and why it is so important to the study of Christianity. An early depiction of the Hebrew Bible translated into Greek as the Septuagint. Image credit: Photo by Xerones, CC BY 2.0 via Flickr. The name Septuagint refers to what is mostly a collection of ancient translations. The Jewish scriptures were translated from Hebrew and Aramaic into Greek from about the third century BCE in Alexandria, a place booming with Hellenistic learning, to perhaps as late as the second century CE in Palestine. Originally the translation was of the Hebrew Torah alone. A legend was written in the second century BCE to explain how the collection came about. In the legend, seventy learned men from the twelve tribes of Israel came to Alexandria to translate, so later when this tradition was passed down, the name “Septuagint” (seventy) was given to the entire collection of books that make up what Christians call the Old Testament. The ancient world had known about translation activity, but there had never been a project this size and certainly not one for religious motives on this scale. I’ve always thought it’s one of the most important cultural artifacts of antiquity, but it often gets discarded as interesting only to those concerned with biblical studies. But there is also information in the Septuagint about the Greek language of the period, the socio-religious context of the Jewish Diaspora, and the very science of translation. To me, the story of the Septuagint’s creation—what it tells us about the growth of the Hebrew Bible and the Christian Old Testament, and its role in the birth and early development of Christianity—is absorbing. Not much is known about the Septuagint outside of the academy. Why do you think that is? In the West, we have a cultural tradition dominated by Protestant and Catholic Christianity. An early Latin version of the Bible was made as a translation of the Septuagint, but by the end of the fourth century Jerome began to argue that the Bible was in need of revision. He thought the Old Testament should be translated from the Hebrew so that it would match the Bible of the Jews. Jerome’s new translation, later called the Vulgate, was the first significant challenge to the position of the Septuagint as the “Bible of the Church.” As the Latin Church grew apart from the Greek East in the next half millennium, Jerome’s Vulgate finally became the standard Bible. The Protestant Reformers basically accepted Jerome’s position on the authority of the Hebrew Bible, and for that reason the vernacular translations were made from the Hebrew. So for the last 1500 years, the Septuagint has struggled to find readers in the West, although it is still read in the Greek Orthodox Church. The same bias for the Hebrew Bible affects scholars, too. Because the Reformation spread throughout Europe and left its imprint on the creation of the modern European (and then the American) university, the Hebrew Bible has been studied and the Septuagint has been seen as a mere “witness” to the Hebrew text. It was thrown in the Bible scholar’s toolbox to use only when the Hebrew was difficult to understand. 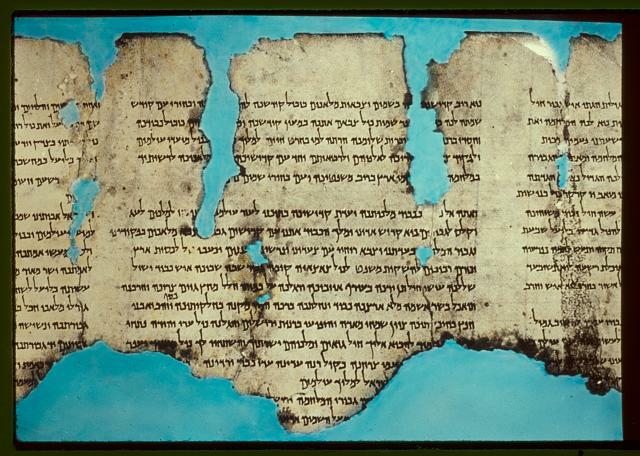 A photograph of the War Scroll, one of the Dead Sea Scrolls. Photographed by Eric Matson of the Matson photo service, 21 May 2012. From the Library of Congress. Public domain via Wikimedia Commons. When we think about biblical manuscripts, the Dead Sea Scrolls have of course gained a lot of attention since their discovery in the 1940s. In some ways the Septuagint benefitted from the Scrolls. The Septuagint is commonly treated only as a translation of the known Hebrew Bible text, and in some places a very bad one! But the discoveries in the Judean Desert provided a boost to interest in the Septuagint. Up to that time, the Hebrew Bible texts that were studied were the medieval editions. The Dead Sea Scrolls for the first time revealed many biblical texts that were a millennium older than the medieval editions. More spectacularly, these manuscripts showed significant divergences with the standard medieval text in some well-known biblical books. The Scrolls proved that some books of the Hebrew Bible were still being edited, supplemented, reduced, etc., well into the Common Era. But if you were reading the Septuagint before the 1940s, you knew that it was produced in the Hellenistic period, and so you still might have concluded—even without the help of actual Hebrew manuscripts—that the Bible was in flux at this time based on the way these books appear in Greek in such alternative forms. Imagine if you knew Russian, and when you were reading Dostoevsky in English you suddenly discovered that there was an entire extended passage, or one that was significantly abbreviated. You have two options. You either conclude the translator exercised a tremendous, even scandalous, amount of freedom, or you believe the English translator had a manuscript different to any others you ever knew existed in Russian. Those were the two basic options for understanding the Septuagint, and most scholars chose the first route. But when the Dead Sea Scrolls showed these divergent text forms in Hebrew, and when some of these were represented verbatim in translation in the Septuagint, the calculus suddenly changed. Now that we had the Dead Sea Scrolls, we knew the Septuagint translators were in many of these cases translating actual biblical texts. Septuagint scholars are about as grateful as any for the discovery of the Scrolls. The biblical texts from the Judean Desert now confirm what those familiar with the Septuagint already suspected: the divergences in some biblical books give a window into the Bible’s early formation history. What role did the Septuagint play in the formation of Christianity? Beginning with the New Testament itself, we see the influence of the Septuagint because these writers of what would become Christian scripture are writing in Greek. It’s natural that they turn to the Greek Jewish scriptures, but in some cases we can see how the Septuagint provided the perfect phrase—different to the same passage in the Hebrew—for them. The apostle Paul, for example, builds much of his magnum opus, the Book of Romans, with quotations from the Septuagint, not the Hebrew Bible. Most of the early Christian movement was a Greek-speaking movement, so they too adopted the Greek Jewish scriptures as their new “Old Testament.” The early development of theological, homiletical, and liturgical language is almost exclusively indebted to the Septuagint. More needs to be done in this area, but it is clear that the Septuagint lies at the foundation of early Christianity. Timothy Michael Law is Publisher and Editor-in-Chief of The Marginalia Review of Books. He is the author of When God Spoke Greek: The Septuagint and the Making of the Christian Bible and tweets @TMichaelLaw. Thank you for helping draw more attention to our Scripture. As an Orthodox Christian, it is much appreciated. 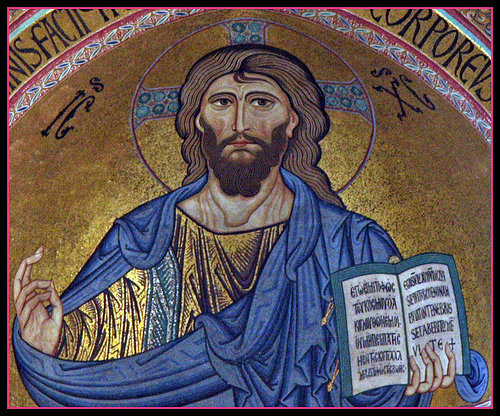 One point of clarification: the icon depicted above of Christ is the Christ Pantocrator (almighty, from El Shaddai), and he is holding the open Book of Life. This is a reminder that, while Christ will return for the last judgment, the book is not yet closed. We have time to repent. Thanks for so many ellucidations about the Septuagint version. I have some historical and eastern christian religious comments I want to make. 1) The great amjority of eastern christians did not speak greek and many poets and authors deep in the 13th and 14th centuries from Lebanon and going inwards in Syria and Mesopotamia and Persia and even India and China did not speak any greek and did not rely on the greek Septuagint but relied on the Aramaic Peshitta but still they thought it was faishonable to know greek and have some words introduced into their works to show great knowledge, thus, Bar Hebraeus e.g. would write in Aramaic “kul su`rone u theoria” i.e. “every practices and theories”. Another example is the name of the book of Acts which the Assyrian Church of the East calls it “su`rone da sheliHe” (acts of the Apostles) and the Syriac Orthodox Church of Antoch calls “praksis da sheliHe” or “practices of the Apostles”. 2) In the Syriac/Assyrian churches after Christmas and in January/February, they celebrate the day of “Shem`un sovo” (= Old Simon) who, according to tradition was one of the 72 translators and when he came to Isaiah and read the prophecy and gave full attention to what was written he doubted that a virgin could give birth to a child and so an angel came to him and told him that as he did not believe in God´s word he would live to see it and in due time he travelled to Jerusalem and sat at the entrance of the temple awaiting the Messiah who would be born from a virgin without a man and when Jesus was 7 days old, as per jewish tradition he should be circumcised and when he saw Jesus he believed in Him and said “now my Lord, I ask you to give peace to this body because I have lived to see the Messiah”. At that time he would have lived three centuries and for that he was called ” Shem´un sovo”. 3)Last, the Dead Sea Scrolls were not discovered in the 1940´s but in 1926. My uncle, Father Butrus Sowmy (butrus is arabization of aramaic peTros which comes from latin Petrus, i.e. Peter) and 2 other seminarists at St. Mark´s in Jerusalem (Yeshua` Samuel and Mikhael Mardinly) together with Ya`qoub Salehoyo (later bishop of Jerusalem) bought the 4 first discovered Scrolls from two bedouins in 1926. John C. Trever in his book “The Untold Story of Qumran” had a hint of this year when Father Butrus Sowmy and Bishop Athanasius Yeshua`Samuel told him in their meeting that the books were with them for more than 20 years and that was in the begining of 1948. This is an incredibly pompous sort of statement, the sort that only an academic would make. I want to but an LXX. I dont know which one to acquire,so I would appreciate the advice given.I need and English/Greek version, not a purely English translation.I am not an academic, but value looking the original wording in the Greek language.Thank you in advance. Timothy Michael Law wrote about the Greek East (Byzantine Empire) and NOT about the Orientals! Jews are circumcised on the 8th day; Jesus was circumcised on the 8th day! King Ptolemy forced 70 Jewish sages into writing the translation all in seperate rooms with intent to subsequently ridicule the Bible by demonstrating the great variations in the translations. His scheme backfired.